Pupil Premium, is additional to main school funding and is allocated to schools based on the number of free school meal pupils and the number of looked after children a school has. The Government sees this as the best way to address the current underlying inequalities between children eligible for free school meals (FSM) and their wealthier peers by ensuring that funding to tackle disadvantage reaches the pupils who need it most. It is for schools to decide how the Pupil Premium is spent, since they are best placed to assess what additional provision should be made for the individual pupils within their responsibility. Whilst schools are free to spend the Pupil Premium as they see fit, they will be held accountable for how they have used the additional funding to support pupils from low-income families. From September 2012, schools were required to publish online information about how they have used the Premium. This will ensure that parents and others are made fully aware of the attainment of pupils covered by the Premium. The Government decided that eligibility for the Pupil Premium in 2012-13 would be extended to pupils who have been eligible for free school meals (FSM) at any point in the last 6 years ‘Ever Six ‘children. Also children that have been adopted from care are also eligible for Pupil Premium. Within the overall resource allocation, Pupil Premium funding will be used in the first instance to support the learning needs of ‘Ever Six’ children – those in receipt of free school meals, now or previously. However not all pupils in receipt of free school meals require additional support to fully attain their potential , not all parents/carers entitled to claim free school meals for their children make a claim and not all children requiring additional support are entitled to free school meals. So the Pupil Premium provision may also extend to other children who have been identified as ‘vulnerable’. The school’s Senior Leadership Team will monitor the attainment and progress of all pupils and decide which pupils need additional provision and what this provision will be. The SLT will use on-going and fixed point assessment to identify children’s learning needs and with the class teacher plan for the appropriate provision to best meet a child’s needs. Parents of targeted children are supported in the education, and social and emotional development of the child. Provide a twice weekly homework club for targeted children organised by 2 teaching assistants. Employ a Speech and Language Therapist (SALT) 1 day per week to assess the needs of the children in Reception and year 1 and plan programmes of work to meet their individual needs. The SALT will also provide training and support for the class teaching assistants to enable them to deliver programmes on a regular basis and deliver parental workshops. To staff and resource a nurture setting to enable children to develop strong self esteem , a sense of belonging and resilience . Nurture groups will offer a short term focus intervention which address barriers to learning arising from social and emotional difficulties. Continue to buy into Wigan Family Welfare School counselling Service to enable children with social and emotional issues to overcome barriers to learning. A counsellor is assigned to the school and comes in to work with identified children one morning each week. The impact of the success of the nurture setting can be measured by children’s increased ability to interact with others in a positive way and to self control and manage their own behaviour. Also an increased self awareness, confidence and motivation. The impact of this extra support and the intervention put into place to support these children is monitored each term at each pupil progress meeting held between a member of the leadership team and the class teacher. Provide teacher support 1 days a week for children on the SEND register. Assessments will be carried out in order to identify barriers to learning and to provide support plans to accelerate progress. Provide a weekly homework club for targeted children organised by the Learning Mentor. Employ a Speech and Language Therapist (SALT) 1 day per week to assess the needs of the children in Reception and year 1 and plan programmes of work to meet their individual needs. The SALT will also provide training and support for the class teaching assistants to enable them to deliver programmes on a regular basis. To invest in training for non teaching staff in Lego based therapy which is a social development programme which helps children with social communication difficulties. 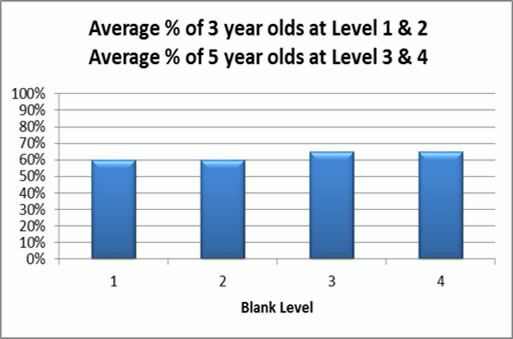 It has always been evident from in school and external data that by the time the children reach Year 6 the gap between the pupil premium children and non-pupil premium children has narrowed due to the support and intervention programmes that the children have received throughout their time in school. There were 9 PP children in this year 6 cohort. Pupil premium children performed in line with non-pupil premium in reading , only slightly below in maths and below in writing . The 2 children who did not achieve ARE in writing are both on the SEND register. At the end of KS 1 the widest gap is in writing. Whilst the pupil premium and non pupil premium attainment is in line it should be noted there are only 4 PP children. •	The following graphs provided by the speech and Language Therapist show the Reception children’s progress throughout the year and is presented alongside the graph showing the average performance of children across the country. 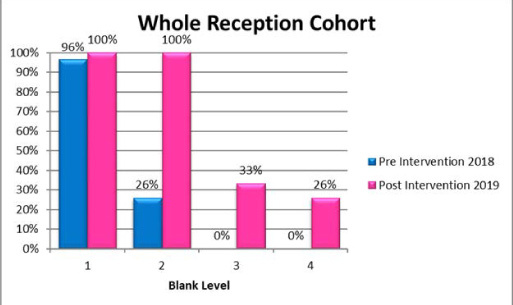 This data shows that on-entry the Reception Class were significantly below the National Average at Level 2. Much progress has now been made and results show that our children are slightly above average at Level 3, but significantly below average at Level 4. Soft data clearly indicates the progress made by the children who have accessed support put in place. As they progress through school they have developed strategies to overcome social and emotional barriers thus enabling them to access learning. There are 5 pupil progress meetings throughout the year in which these children are carefully monitored. Excellent support from the LA TESS (Targeted Educational Support Team) has also impacted on the progress made by these children.